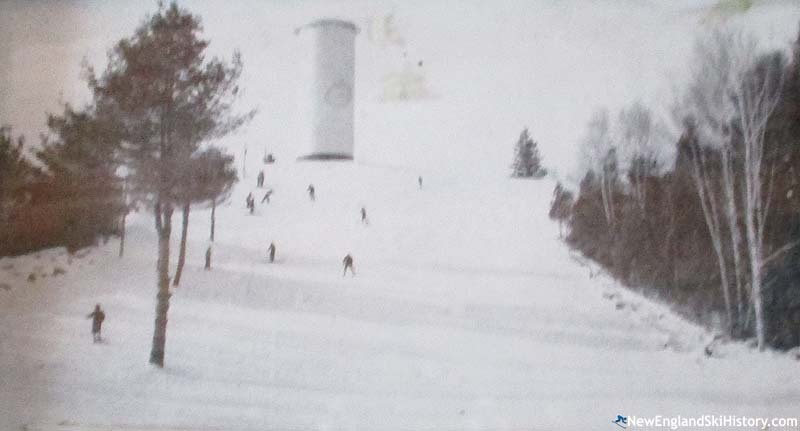 Located near the Sebasticook River on the northwest side of Pittsfield (between Augusta and Bangor), the Pinnacle has been home to alpine skiing for over half a century. In the early 1950s, former Bowdoin ski team member Jack Baxter and PSIA instructor Byron "Bud" Dow were troubled by the lack of opportunities for local youngsters to learn to ski. In the fall of 1954, the duo worked with an elderly property owner and the local Kiwanis to develop a small ski area on the eastern slope of an area known as the Pinnacle. Through the hard work and donations of many local residents, the ski area was open by early that winter. Known as the Kiwanis Community Ski Slopes, the 140 vertical foot ski area was served by a rope tow. By the end of the season, dozens of kids a day were taking part in ski school classes. Over the next decade, the property likely ended up in the hands of the Town of Pittsfield and the Maine Central Institute. The area grew to feature open slopes on either side of the rope tow, a steep race course into a gravel pit, and a ski jump between the slope and the race course. Unfortunately, instructor Bud Dow passed away in 1979. 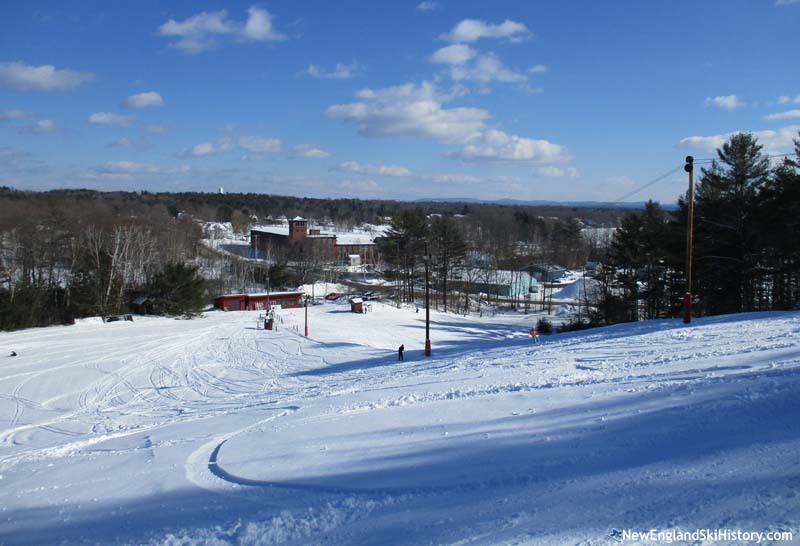 The small ski area has remained in operation, operated by the Pinnacle Ski Club. 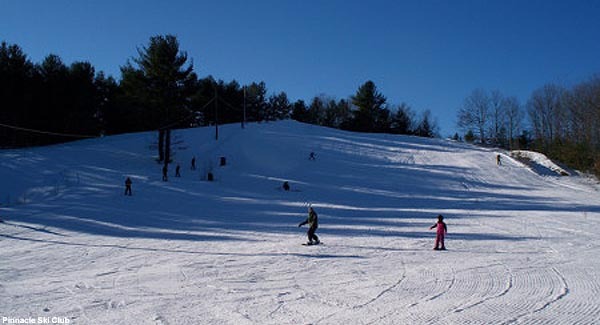 The ski area is composed of multiple slopes and trails, serviced by two rope tows. While there is no snowmaking, the area does have night skiing. "So many great memories. Wooden skis, lace up boots, 14 years of racing, donatating time to operate and teach classes, young and old. An experience of a lifetime. The best of Pittsfield, ME." "Jack Baxter, who conceived of the idea of creating The Pinnacle Ski Club (first known as The Kiwanis Ski Slope) in the mid-50s, and who along with Bud Dow�s engineering genius, brought it to fruition, will celebrate a personal landmark this year. He turns 95 on March 11 in Loveland, Colorado. Jack will celebrate his birthday with his children Connie Baxter Marlow, John (Randy) Baxter and Judy Baxter and several grandchildren and great grandchildren (all of whom are or were skiers.) See Jack�s 'Ski Chatter' in The Pittsfield Advertiser 1954/1955. Skiing was a life-long passion for Jack whose enthusiasm and commitment to the sport influenced many of the Pittsfield youth in the 50s and 60s as he and others developed the ski school at The Pinnacle and contributed to the development of the Sugarloaf Ski Area not far away. After his move to Oregon in 1965, Jack skied at Mt. Hood and Mt. Bachelor well into his 80s, as well as The Rockies and European resorts." "I remember my first ski race at the Pinnacle when I was 8 or so. My parents, Jack and Alice Baxter had been avid skiers for decades and taught lessons at The Pinnacle. Dad did the countdown and when he said 'Go' I wet my pants and pushed off! Skiing and ski racing became a lifelong passion. In college in Massachusetts I was head of the Women's Intercollegiate Ski Conference (WISC) and my parents sent me to ski racing camp at Mt. Hood, Oregon. (They had moved to Oregon from Maine in 1965). There I met and fell in love with my coach Pepi Stiegler, Austrian Olympic Gold Medalist in Slalom in 1964 ( Billy Kidd won the Silver and Jimmy Huega won the Bronze that year.) Pepi and I were together in Jackson Hole for 9 years. I became Executive Director of SKI THE ROCKIES, a marketing group of the 12 major Rocky Mountain ski resorts, left Pepi and moved to Aspen in 1976 where I met my husband and raised three children, none of whom became avid skiers even though they were on skis as soon as they could walk. It all started at The Pinnacle in Pittsfield, Maine - so happy it is still providing foundational skiing experiences for the children of Pittsfield - thanks Dad, Bud, Kiwanis and all who made it possible."